Encore Recertification Program – Protect Your Investment! The Encore Recertification Program from FRD USA shifts the burden and expense of routine breaker maintenance onto factory-trained FRD technicians and away from overworked, understaffed service departments. Overlooking routine maintenance on any hydraulic breaker can be a costly mistake. Regularly maintained breakers upgrade your initial tool investment and decrease the likelihood of breaker failure during operation or rental. What’s more, upgraded equipment will increase utilization, generating more revenue. 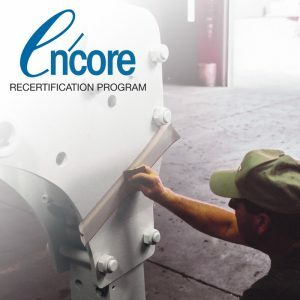 Designed to extend the life of your hydraulic breakers, the unique Encore Recertification Program offers three distinct service levels, each incorporating various maintenance options. From routine tool inspection to complete overhaul, you choose the level that best suits your needs. Tier II: In addition to the inspection report, tier II includes all seals, a diaphragm, four through-bolts and related hardware. We’ll even polish the piston and cylinder before reassembly. Your unit will be returned assembled with all bolts factory-torqued, all nitrogen chambers properly charged and the breaker painted and decaled. on same type working steel (moil / chisel / blunt). *NOTE: Occasionally, the piston and/or cylinder are NOT able to be adequately polished before exceeding FRD USA’s minimum wear limits. Be assured we will make every effort to utilize your existing components before recommending replacement. On occasion, rebuilt Furukawa Rock Drill attachments are available. Please contact your sales representative for an updated list.